Mobile applications for retail data collection can help companies optimize merchandising performance and control inventory. VisitBasis merchandising software is a complete retail data collection solution to manage your merchandising activities with ease. VisitBasis merchandising software solution helps businesses reduce costs and increase productivity of merchandising operations. Our customers use VisitBasis merchandising software to streamline data workflow, get real-time picture of retail conditions and enhance interaction between office managers and field representatives. 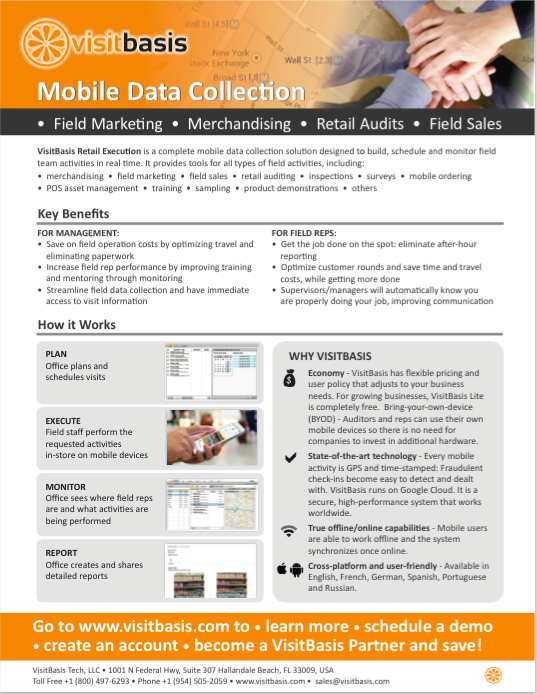 Below you can find information on how VisitBasis merchandising software helps companies save time and reduce expenses. Save Time to Improve Productivity. When merchandisers are able to use their own mobile devices to perform tasks at retail locations, they collect retail data faster and concentrate on customers, not paperwork. Automated scheduling, fast data entry, instant data transfer to corporate database, analytic capabilities, and route optimization are among those time savers that allow your merchandisers and their managers to drive greater efficiency and improve your company’s bottom line. Save Money on Data Collection Devices. SaaS merchandising mobile solutions for Android & iOS tablets and smartphones allow BYOD strategy implementation, so your company saves money on hardware (no need to buy mobile devices, your merchandisers can use those they already have), IT costs (no need in servers and IT staff) and training (your merchandisers use the devices they already know how to operate). Reduce Operating Expenses. When using a merchandising software solution the managers and supervisors get an ability to manage both inventory and sales data for each retail location. Sales and marketing departments can use merchandising software simultaneously, which saves money and strengthens cooperation between the managers. 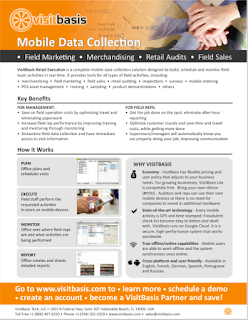 Merchandising software allows manage all data collection operations from one easy-to-use system, so you can save on scheduling, analytic software, GPS-tracking systems for field staff, order processing applications and more. Cloud merchandising software vendors offer free Cloud data storage as part of their service, so you can also save on data storage costs. Cut Your Inventory Costs. Merchandising software provides merchandisers and their managers with access to the history of retail visits. Always having at hand the information on merchandising audits, amounts of previous order quantities and product returns, the managers are able to better evaluate the needs of stores and anticipate the volume of goods that must be delivered to each retail location. In this way merchandising software allows your company to get higher inventory turns, decrease inventory levels and reduce operating expenses due to lower inventory control. VisitBasis merchandising software is a complete retail data collection system to manage your merchandising activities in the field. VisitBasis uses the latest Cloud technology, which means your retail data is accessible to you at any time, from anywhere. VisitBasis merchandising software is designed for Android and iOS tablets and smartphones, which allows implementing BYOD strategy to reduce hardware and staff training costs. Easy access to retail data for managers and merchandisers provides actionable insights for your business to manage it more effectively and improve the bottom line. Register account at www.visitbasis.com today to get your free access to merchandising software.